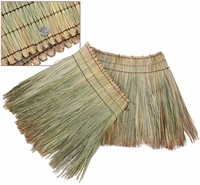 Tahiti Thatch - Quantity of 4 panels. FREE SHIPPING!!! * Each thatch roof covering provides 2.5 sq ft roof coverage when installed 12 on center. FAQs About Tahiti thatch: I am installing a Tiki Shack Tahiti thatch roof covering and I need to cut a panel width as it is too long, how do I go about that? Can I install the Tahiti Thatch Panels directly onto an existing roof?